Himalayan Challenge Mountain Biking Trip exploring Himalayan wonders on mountain bike and more different ways with heart and soul……..requires sense of adventure!!! Those who are seeking for best biking experience in the Himalayan – Annapurna round trip takes one of the most challenging exploration journeys for life time. Where you will discover one of the great ranges if biodiversity on Earth. The amazing views of pristine snow clad mountains and top to bottom colorful traditional cultural activities of locals of around makes the mountain biking trip unforgettable. Besides the entire biking trip also leads you cross the biggest Thorung La Pass (5416m) second highest lake and deepest gorge of the World exploration. The wonderful panoramic spots are also well known photographic destination among the adventure lovers. The proposed itinerary we have tailored bellow which is ideal for every intermediate biker. The package is based on perfect way to acclimatize and rest for riders as need day by after riding. We are also happy to figure out regarding this trip according to your holiday schedule or requirements. Day 01: Arrival Kathmandu, pick up from the airport and transfer to hotel. Day 02: Preparation day- check up bike, introduce with team members and complete official formalities. Day 03: Drive to Balaju Bypass by private Jeep and warm up bike ride to Kakani and overnight at basic tea house lodge. Day 13: Ride the mountain bike up to Godawari Village Resort. 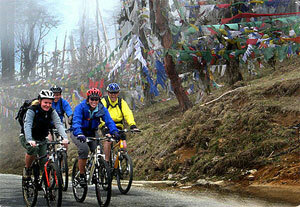 Day 14: Ride the mountain bike up to Kathmandu, end the trip and transfer to hotel. Day 15: Transfer to airport and final departure or go for own ward program. Airport transfers – pick up and drop. Conservation Area Project entrance permit fee. Personal Gear, International airport departure tax, Lunch and dinner in Kathmandu.